Happy National Coffee Day! Did you remember your cuppa this morning? If not, there is still time to get a hold of a delicious, expertly brewed espresso from ChocXO who roasts and grinds its own beans. Though their coffee service started out with just two types (light and dark roasts), they have since expanded into single origin espressos and various other ways to present coffees to their fullest potential. Don't worry - if the choices seem daunting, the flavor profiles on the menu will help out; these descriptions also allow you to determine how to play around with your chocolate mix-ins (should you choose to do them), and there are educated baristas to help. 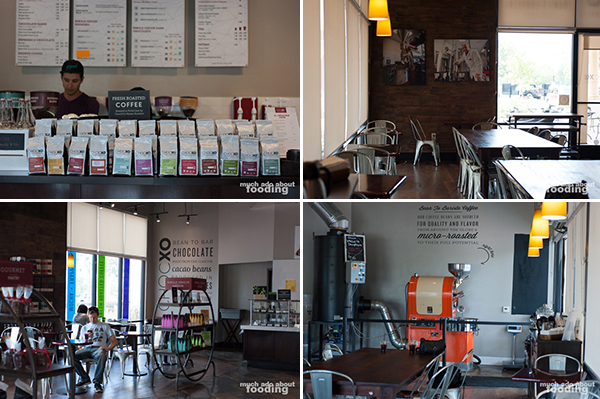 While most coffee shops serve a single espresso, ChocXO stands out for giving you choice and why not? There are such varying palates and opinions about coffee that having just one type is a waste of taste. Not only are the beans unique there for these espressos but so is the whole process they do of roasting and grinding their own coffees. 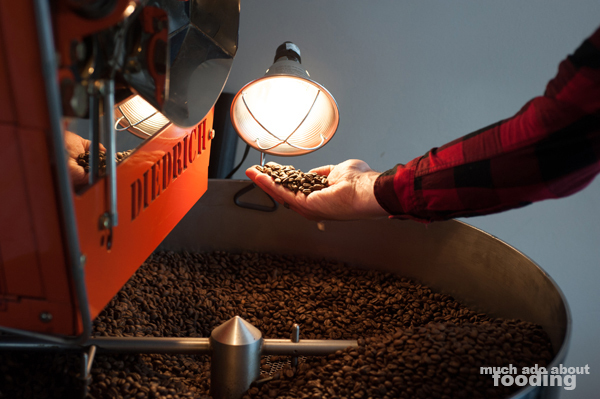 We got a personal look at how Lead Coffee Roaster Matt Thornley creates these perfect roasts for their coffee. "I wanted to get experience commercially roasting because I roasted at home all the time. When I met Tim Higgins, previously of Green Earth Coffee which ChocXO bought from him, I ended up working with his head roaster until he left. Then I'm here now." 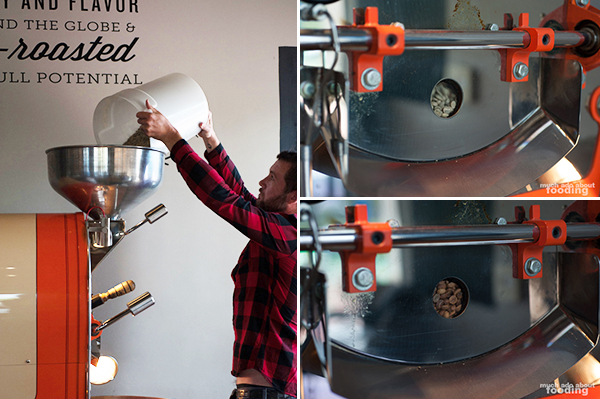 Using a Diedrich roaster, Matt explained to us trends currently happening to roasting. 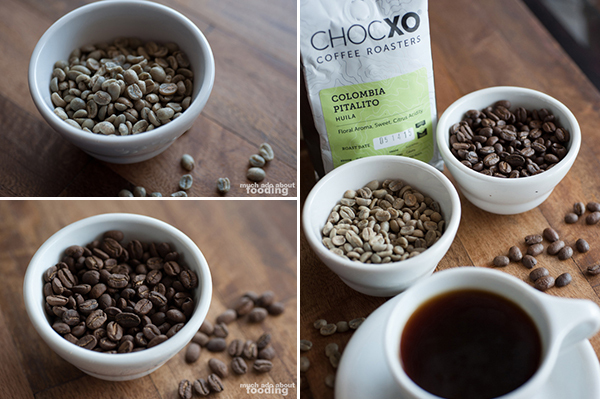 For one, third-wave coffee is entrenched in lighter roasts these days, and ChocXO roasts light as well. 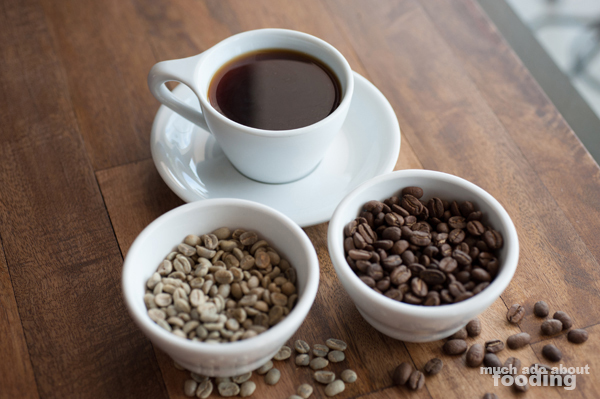 Unlike the typical dark roasts of commercialized, retail coffee, the lighter roast is able to bring forth the natural flavors of the beans themselves. 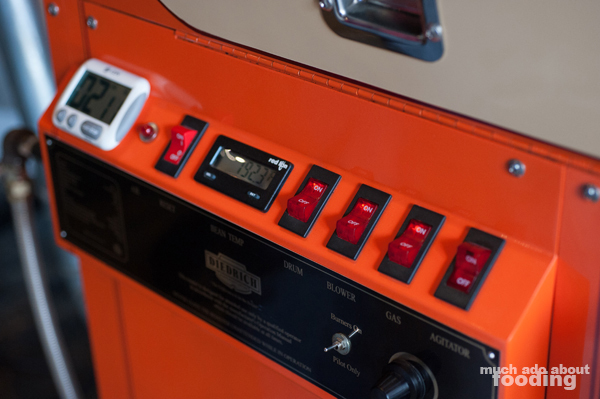 During the roasting, he began with green beans, waiting for the roaster's charge temperature (the temperature of the air inside the machine) to hit 425°F before dropping the beans in and starting a timer. Here is when the recordings started of marking down the temperature every 30 seconds to ensure consistency with previous roasts of the same bean. The slightest change can lead to significant roast profile shifts. We wondered how one would slow down a roast that is rising too quickly in temperature but Matt quickly showed us how adding air will slow down temperature rises. "You want to control the temperature to where you want it to be. Going too fast means you lose control. The rate of rise should always be decreasing during the roast but never actually plateau." Apparently, though you can roast beans to the same darkness, their profiles can still change in taste if the journey of temperature and air shifting differ. However, they do all follow the same stages during the roasting (drying phase, mid phase, and development phases), and as a roaster, you look out for the first crack. This particular roast we witnessed cracked at the 10:30 mark. This is a good indicator to the roaster of how far to take the roast next. As an explosion of energy from the moisture inside the bean, the first crack is a satisfyingly loud sound. There is also a second crack if you were to roast dark coffees but we did not witness that as he was going for a light roast. "This is medium roast but most major companies would call it a light roast. Light and dark doesn't matter to me - we're trying to get it to the best bean it can be. We intentionally don't say which type of roast it is because we just roast it to its best. When I check the roast, I'll pull out samples every 30 seconds into a smaller roaster to sample and then I'll take it to the big roaster." Matt worked with the Colombia Pitalito beans which are known to have notes of citrus and jasmine. It is also one of the ingredients in ChocXO's main espresso blend. Once one of the pulls of the green beans revealed the right color of brown, he started up the agitator and unleashed the beans into the cooling bin. Here, the agitator moved the beans around to cool evenly with both air coming through the open top and through the bottom. 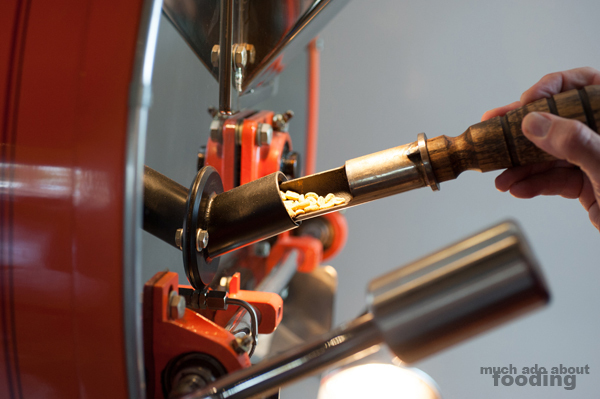 This allows for the roasting process to stop as quickly as possible; if not done correctly, your beans could continue roasting internally and end up with the bitterness associated with dark roasts. 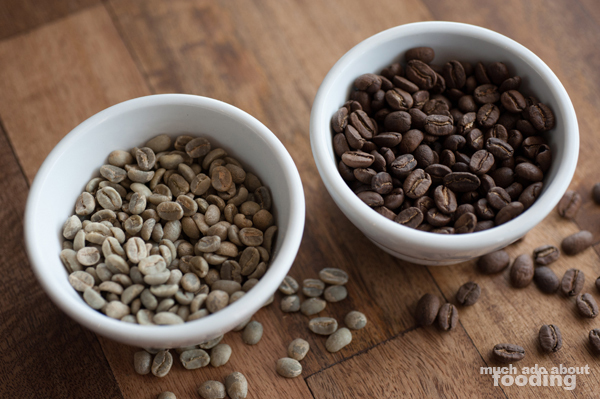 The difference between the beans from the start to the beans after the roast was significant. Not only had the color changed but so had the weight as moisture was lost throughout the process. 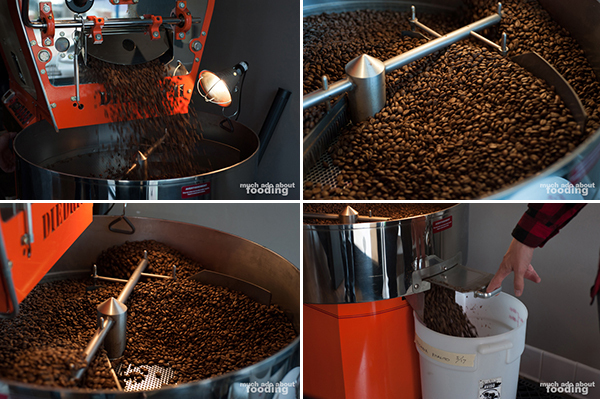 These factors will vary from bean to bean during the roasting. Aerodynamics of each bean as well as their shape and size matter during the process as well, and it was obvious that Matt knows his beans after doing upwards of 20 roasts in a single day, 18lbs at a time, two to three times a week. 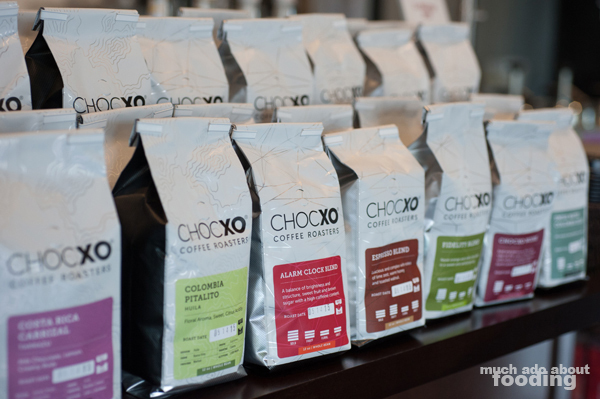 At ChocXO, everything is roasted within a week of being sold so bear in mind that your coffee will be as freshly roasted as manageable. Tell me about the term "single origin." "Sure. Single origin can refer to a lot of different plants from the same place whereas single variety means from one type of plant only. Our Nicaragua is single variety." The announcement of ChocXO's single origin espressos made it one of few in the country sourcing and offering single origin. Not only is the sourcing done with much careful consideration in terms of ingredients but the ethics and labor conditions are also taken into thought. ChocXO prides itself in having seen each farm from which they purchase product and ensuring that the farms are growing organic in good work conditions. For those needing more explanations of each, the board menus behind the counters have flavor profile explanations and if purchasing bagged coffee, the back of each label gives details about the area from which the beans came. 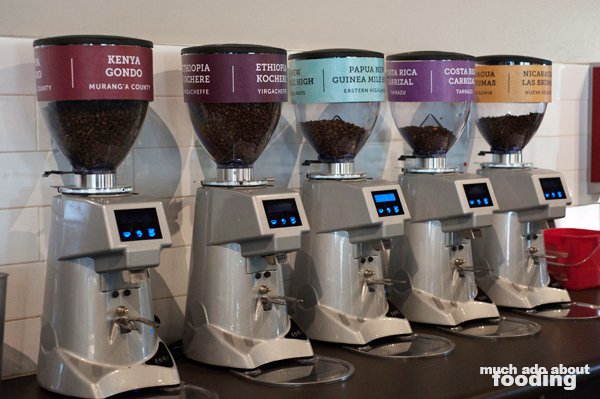 How do you decide on the coffees you offer? "We want a wide variety of regions, flavors, and taste profiles at a time so there is choice. We'll rotate every 120 days as well with limited edition roasts in between." Part of the introduction of both single origin espressos and single origin liquid chocolates includes the freedom now to mix them together into a chocolate-enriched coffee drink. We tried out a few of these mixes ourselves including the most popular drink - the Signature Mocha made of the espresso blend and dark chocolate ganache. 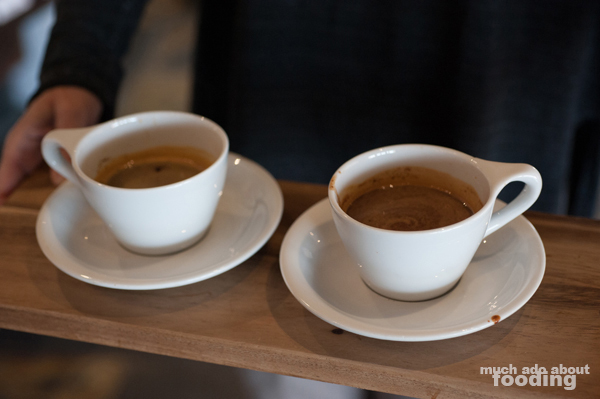 To start, we tried the Papau New Guinea Mile High on its own; a fruity espresso, this one stays with you a little while. With dark chocolate ganache, the fruitiness was mellowed out and though the smell was overwhelmingly chocolate, the drink was not very sweet. Using the 80% liquid chocolate ended up highlighting the fruitiness because they were both heavy on that taste profile. When we added the certified heirloom 75% Guantupi to a fresh shot, it was a pleasant balanced drink that still maintained the fruit notes but not as boldly. Lastly, adding in white chocolate ganache turned the espresso into a creamy, almost latte-like drink that was just as sweet as white chocolate tends to be. In addition to the tastes changing depending on which chocolates were added in, the textures shifted as well for both the ChocXO staff member mixing the drink and the drinker. 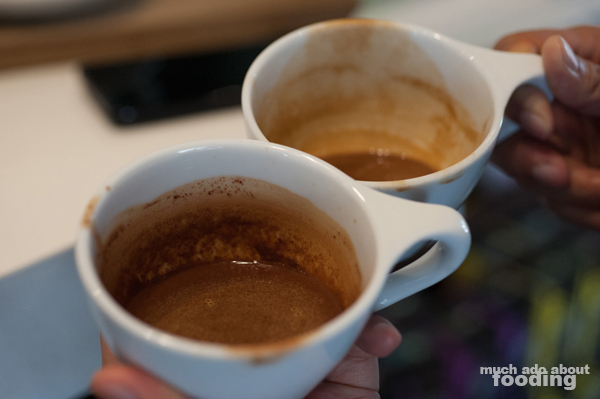 For example, the 75% Guantupi ended up as a sludge-y cup while others had more distinct particles and residue in the cups. Additionally, the single origin chocolates as a whole would clump up into balls if poured straight into a cold drink because there was no tempering dairy in those. So the options are multiple at ChocXO on how to tackle the coffee and chocolate together. If you're interested in trying out one of their endless combinations or just sipping on some single origin espresso, visit the Lake Forest location at 20025 Lake Forest Dr #101 Lake Forest, CA 92630 as this is where the roasting happens.